This is where the fun really happens and new discoveries can be made. 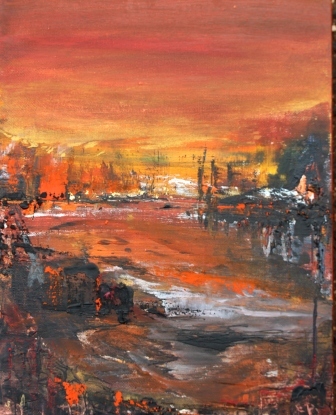 It allows me to cross perceived barriers and take advantage of my preference for exploring many different art media. This painting of a favourite theme, West Coast waves, uses tissue paper on extra rough Fabriano watercolour paper for texture. 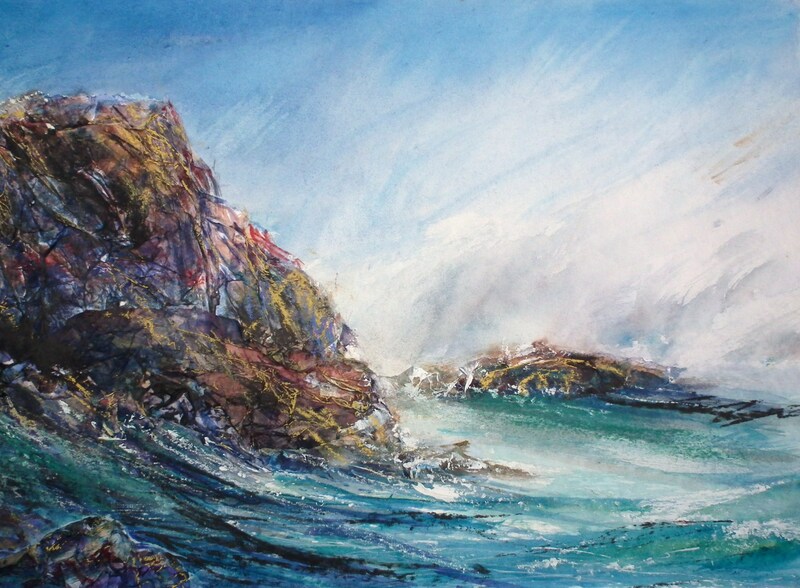 Watercolour was applied wet in wet, incorporating water spray, salt and lifting techniques for the sky and soft spray areas….. working quickly as the wave energetically crashes over the rocks. I work more slowly and solidy on the rocks as befits the nature of those forms. Here I use the palette knife in parts creating even more textural effects and darks with sumi ink both applied with a brush and by dragging the ink stick, wetted, across the surface. I also used some drybrush and finally added sparkles by scratching and scrapping, pressing in soft artists pastel and flicking and dragging a little gouache. The final touch: using a broad very soft goat hair brush I painted a shadow diagonally across the lower left third, thereby increasing the sense of light on the spray due to contrast . This painting combines an acrylic underpainting including mica paste and modelling compound, overworked with oil paint sticks, encaustic and a touch of gold leaf. I did one of your workshops (ink jet image transfers) last year and learned a lot so I thank you. I’m a big fan of mixed media art and just really beginning my journey into art. I’m especially loving your paintings such as this one of coastal settings. They are very dynamic and full of implied movement. I’m hoping to partcipate in more workshops and broaden my skills soon. I appreciate the willingness of artists to share their insights and experience to help those of us not so skilled. Thanks Lisa. If you love mixed media and experimenting, beware as you too may become an art addict! But oh what an addiction! Creating takes you into an exciting world where work and play meld together and mistakes are merely opportunities to be more creative in your treatment of the piece. The book making workshop coming up at the Sheffield art space is a great opportunity to make a journal/book to house your experiments and record your art journey. I really treasure my art journals. I have a small handmade one of encaustic examples.